To speak with a Waystar representative, call 855-818-0715. Waystar is the combination of Navicure and ZirMed, the two top-rated providers of revenue cycle technologies. Waystar simplifies and unifies the healthcare revenue cycle with innovative technology that allows clients to collect more with less cost and less stress, so they can focus on their goals, patients and communities. Simplify and unify your revenue cycle. Healthcare organizations from the largest hospital systems to the smallest practices face unprecedented revenue cycle challenges. Changing reimbursement models, increasing patient financial responsibility, industry consolidation, and regulatory mandates are pressuring both revenue and costs. These organizations can’t face it successfully alone. Waystar provides cloud-based healthcare technology that simplifies and unifies revenue cycle management in every care setting. Our goal is to financially empower healthcare organizations so that they can focus on their goals, patients, and communities. Navicure and ZirMed are recognized as industry leaders, collectively scoring Best in KLAS® claims clearinghouse every year since 2010, including 2018, and earning multiple #1 rankings in both medical claims processing and patient payment solutions from Black Book™ surveys since 2012. ZirMed has received the “Peer Reviewed by HFMA” designation through the Healthcare Financial Management Association (HFMA). The combined company supports more than 400,000 providers, hospitals, health systems and ambulatory services organizations and partners with the leading EHR and practice management solution providers. For more information, visit www.waystar.com or follow @Waystar_RCT on Twitter. Clearinghouses.org receives feedback from a large number of medical billers, office and billing managers, and physicians on a regular basis. What medical billing staff have to say about Waystar is ‘highly recommended’. Clearinghouses.org gives Waystar a rating of 4 stars or ****Highly Recommended. 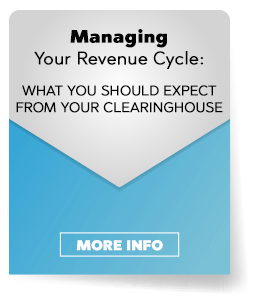 Interested in learning how to overcome the 7 greatest revenue cycle challenges? Download the “Simplify Your Journey to Revenue Cycle Success” eBook today!